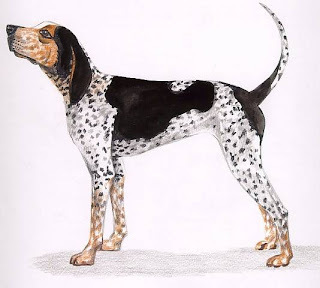 Brought to America,the English Coonhound is a breed that claims its ancestry from French and Irish breeds,having been crossed with the Bloodhound to further enhance their scent tracking capability.They are known to be all-rounders with unmatched swiftness and a highly competitive nature, that is tough, strong and full of zest.Today's English Coonhound commands a different kind of respect, hunting the cougar, raccoon, deer, boar, bear and possum, as opposed to its ancestors,who were only used to hunt the fox and raccoon,due to their inability of tracking quarry in trees,they now are considered cut above their ancestors,after improved n developed capability of tracking scent. They do well in packs rather than being on their own.Furthermore,they well to older children and other house pets they have been brought up with.They also known to be hyper and yet robust and enthusiastic,to the point of being loving, confident, unafraid, trustworthy and protective.The English Coonhound is known for its athletic abilities. English Coonhound usually suffer from hip dysplasia and its important to do a routine check on their paw pads and ears,looking out for any debris.Brushing daily with a firm bristle brush is important.